Access to over 70 easy-to-understand research reports, written for regular investors, and not institutions. How have some of our coverage companies performed as of April 27, 2018? Access our full balanced equity model portfolio, model income portfolio and growth portfolio. 5i Balanced portfolio up +148.43% since inception, +16.52% per year annualized return (as of February 28th, 2019) with no management fees or obligations. Learn from the 90,271 member questions that have already been answered. Many members find this feature alone to be worth the subscription price many times over. *general stock, ETF, fund, and investment questions only. We do not give individual portfolio advice. Our Watchlist feature allows you to get notifications on the stocks you care most about. Any questions we answer on companies that are part of your watchlist get e-mailed on a daily or weekly basis. Don't just know that something has happened at a company, know WHY something has happened. Are you making a critical mistake in your portfolio? Whether you’re a DIY investor or using an advisor, how do you know if you’re taking unnecessary risks with your portfolio? How do you know you’re not limiting your investment returns because you overlooked something or if you’re portfolio isn’t setup properly? Who can you even ask? With Portfolio Analytics, we’ll automatically analyze your existing portfolio and inform you of any dangers and opportunities that we see. If you aren’t properly diversified, and what to do about it. If you’re too concentrated in any particular country (i.e. taking on excess risk), and some ways to fix it. Portfolio Analytics provides Independent opinions on your current portfolio allocations and holdings relative to your personal situation. An investor looking for an independent second opinion on their portfolio. A do-it-yourself investor who wants to ensure they are on the right track. An individual going through a transition phase in their investment journey or implementing a new strategy. Anyone that simply wants an expert and unbiased 2nd opinion of their portfolio for peace of mind. Ten years ago I was forced from work due to illness, at the age of forty with three young children, my financial situation was very precarious. My wages were reduced by 50% and I had never invested in the stock market, it was imperative that I did something to supplement my income. With great advice from you and lots of reading and research, I was able to learn enough to almost return my earnings to their original levels. 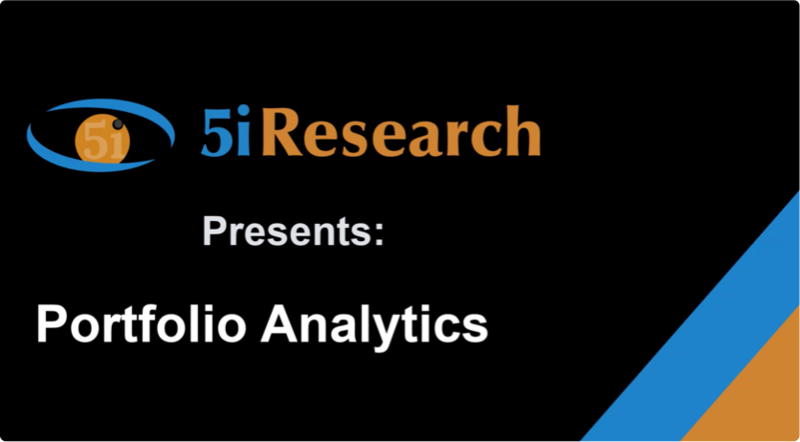 Portfolio Analytics looks under the hood of all the funds that you own, and understands the risks that you might not even know exist. If you hold multiple diversified funds, it is very hard to understand what your regional, sector and even asset class exposures really are. For example, each fund that you own can have hundreds of bonds and/or stocks within it, spread across different sectors and countries. If you own multiple funds, how do you know that you aren’t overconcentrated in any particular asset class, country, or sector? You could be taking on enormous unnecessary risk without even knowing it. We breakdown all the funds you (and your household) hold by sector, geography and asset class, allowing you to see holistically if you are over or under-concentrated in any particular area. We’ll warn you if any concentration issues exist, and tell you what’s driving them, allowing you to quickly optimize your portfolio and decrease the unnecessary risk. 5i, You are the best. Prompt, clear, and concise responses during this tough period, you are worth your weight in gold ! Thank you for your continued support and excellence in service and knowledge. You are definitely the best investment service out there. No more pulling your data from multiple accounts and institutions, and then having to do the same for your partner to get a holistic view of your entire household's portfolio. Now you can quickly and easily have all your investments tracked in one place, with the values updated automatically using the latest market data. With just a click, you’ll know the status of you and your households entire portfolio across all your accounts, and know exactly where you stand with your investments. I just wanted to take a minute and thank-you for adding the "Question" section to the 5i website - I love, love, love it. I'm extremely new to investing and I'm finding everyone's questions and answers very educational. Keep up the excellent work that you're all doing there at 5i, I'm really enjoying your website and love your newsletters. Thanks for watching out for us "little guys/gals". By signing up (and for no extra charge), you can choose to get notifications on time sensitive annual events that you can use to save on taxes and maximize government benefits that you receive. We believe 5i Research® will be your best investment yet. But if you try it today and decide it's not for you, e-mail info@5iresearch.ca within 60 days of purchase and you will receive an unconditional refund (refund does not apply to users taking advantage of any free trial offers or renewals).